The Home Of Ainulindalë, Maiar & Children of Ilúvatar : The Mythical World Of Middle Earth @ “The Fellowship Of The Ring” By J.R.R. Tolkien. 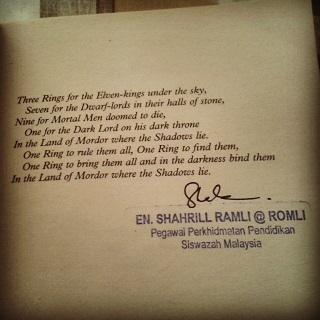 I have successfully finished reading the 5th book I bought via the Baucar 1 Malaysia coupon which is the 1st installment of Lord Of The Ring franchise, namely – “The Fellowship Of The Ring.” I have been the fan of Lord Of The Rings the movie and it took me this long to finally able to read the written version of Tolkien’s masterpiece! Well, the fanaticism is clearly reflected on the name of my blog itself – Undomiel – inspired by Arwen Undomiel, which means “Evenstar” in Sindarin! You can even traced two movie reviews of “Hobbits, The Unexpected Journey” in my 2012 blog entry at https://undomiel84.wordpress.com/2012/12/13/namarie-the-premiere-of-the-hobbits-the-unexpected-journey/ and my 2013 blog entry on “The Hobbits : The Desolation of Smaug” at https://undomiel84.wordpress.com/2013/12/12/mara-aure-silvan-elves-the-hobbits-the-desolation-of-smaug/. My book! The 5th book I bought with the Baucar 1 Malaysia. Really make the most of the incentive given. All I can say is that it is a must and recommended for all LOTR fans to read the book versions because you can find in-depth descriptions of Middle Earth of which you could not fathom via films. 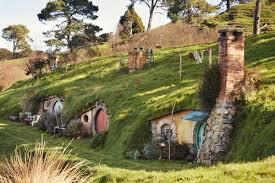 Of course, watching the films prior to read the books HELP to visualize certain depicted settings which can be difficult for your mind to imagine by merely depending on the alphabets such as Rivendell, Lothlorien, Shire, Moria, The Nazguls and many more. 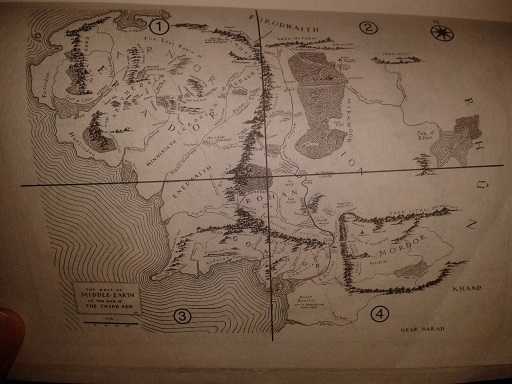 The appendix with Middle Earth’s map. Can you find The Shire? And trail the journey Frodo had to make across Rivendell, Lothlorien and way to Mordor? 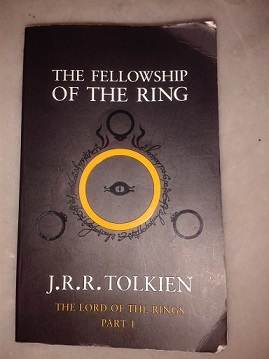 As you all know, this 1st installment tells about how Frodo inherited The Ring from his uncle Bilbo Baggins and then was forced to commence perilous journey to destroy the hazardous ring at Mordor where the Evil Sauron dwelt. I guess I need not to explain the whole synopsis; y’all should know the storyline by heart now, aite? All I can say is that, it can be quite wearisome for some readers who are not fond of eclectic terms to be misconstrued with the unique names of the characters and settings as the novel comprises a lot of those. 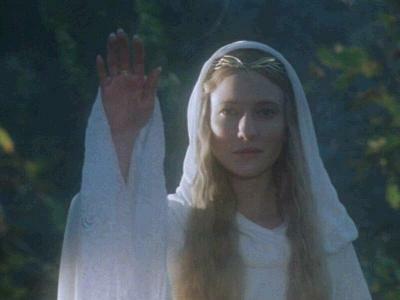 As for me, I love the sound of the Sindarin and Quenya terminologies such as Imladris, Angmar, Minas Tirith, Niphredil, Bruinen, Khazad-Dum, Caras Galadhon, Dol Guldur, etc! Haha! The Fellowship Of The Ring : (Behind) Aragorn, Gandalf, Legolas, Boromor, (Front) Sam Wise Gangee, Frodo Baggins, Merry, Pippin and Gimli The Dwarf. 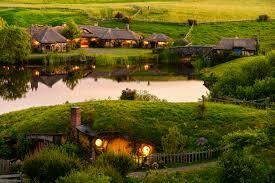 The Shire where The Hobbits dwell in idyllic Hobbiton. 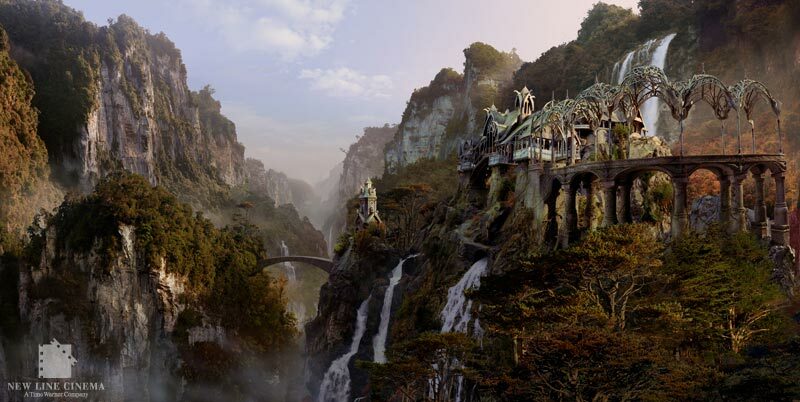 Rivendell or The Last Homely House where Lord Elrond and his daughter, Arwen Undomiel lived. The Gate of Moria, which used to be an entrance to the City of Dwarves. 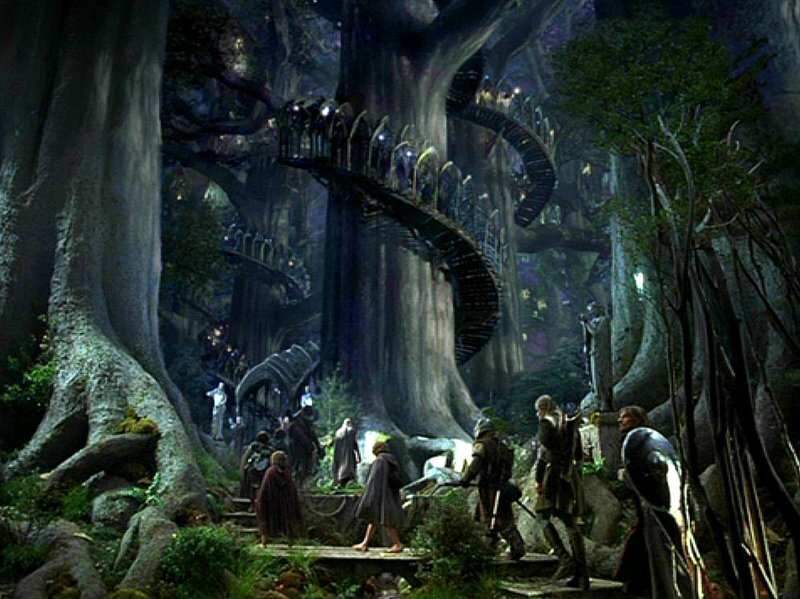 Lothlorien, where the Tree Elves lived. Led by Lady Galadriel and Lord Celeborn. Yéni úntimë ve rámar aldaron! long years numberless as the wings of the trees! ← My Promise @ The Myths & The Facts Of Blood Cupping (“Berbekam”) : Islamic or Arabian Alternative Treatment?